88 Cambridge St, desirably positioned in a tranquil pocket of Collingwood and set back just a few streets from Smith Street, is proving very popular among owner occupiers. The high demand for the apartments can be largely attributed to the community aspect of the development. 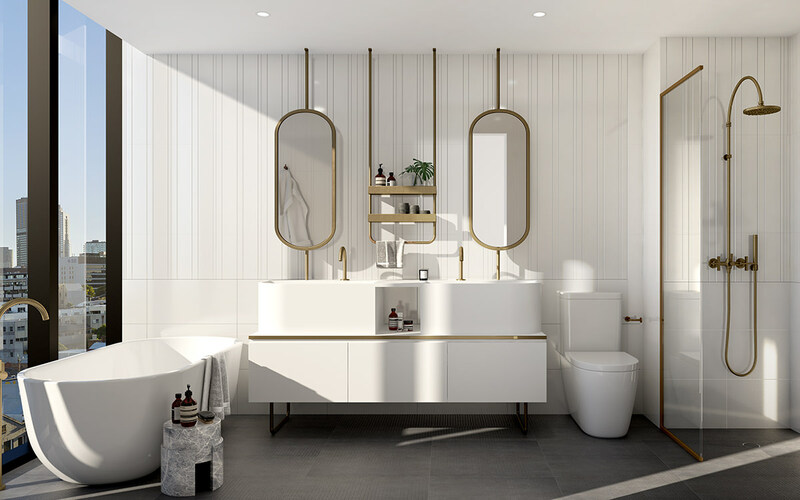 Those living at 88 Cambridge St will not only enjoy a state-of-the-art apartment in an exceptional location, but also a lavish range of exclusive, on-site amenities set to deliver a new type of luxury living. Discover a rooftop unrivalled in Melbourne, complete with an open-air cinema to be enjoyed on hot summer evenings, a bar that beckons cocktail lovers, and city views that elevate the alfresco experience immeasurably. 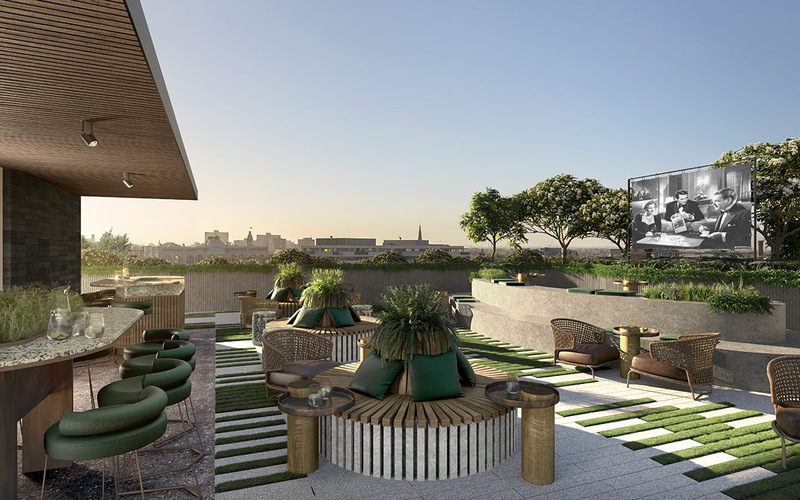 While movies, drinks and dramatic skylines are best enjoyed by night, 88 Cambridge St has a whole new range of opportunities that emerge during the day. Relax in privacy in the sunshine on the rooftop terrace, or meet with neighbours to nibble on the edible food gardens. For a more conventional way to break bread with the community, or to meet with friends and family, the café on the ground floor serves delicious food and sits next to a pleasant north-facing park. If formal dining suits the occasion, seeking the perfect venue will no longer be a worry. The stylish private dining room on your rooftop, elevated to deliver the most breathtaking views, is simply perfect. Invite your loved ones over for a special evening and enjoy the sensation of luxury, all the while being moments from your apartment. After a fabulous evening beneath the stars, you’ll look forward to inviting the afterparty downstairs to your impressive home. 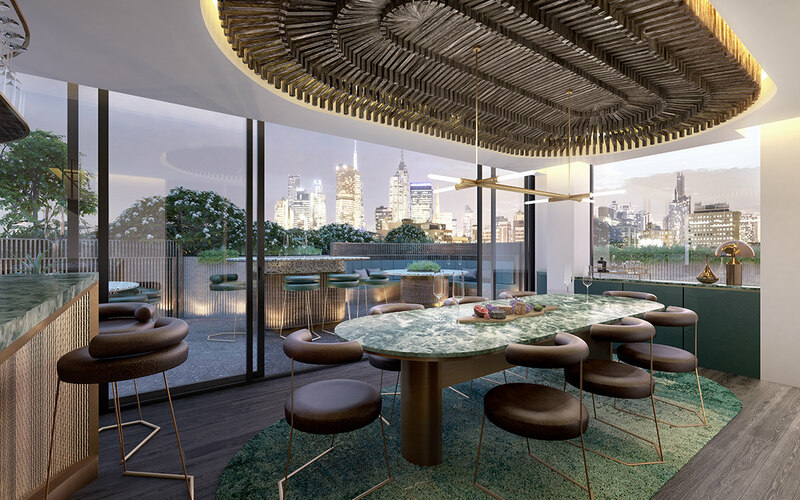 Because beyond the building amenity lies the fascinating architectural design by Elenberg Fraser and luxurious interiors of the apartments within. Elegantly calm, the generous living spaces are composed with consideration for the organic flow of living and finished with a palette of natural materials. 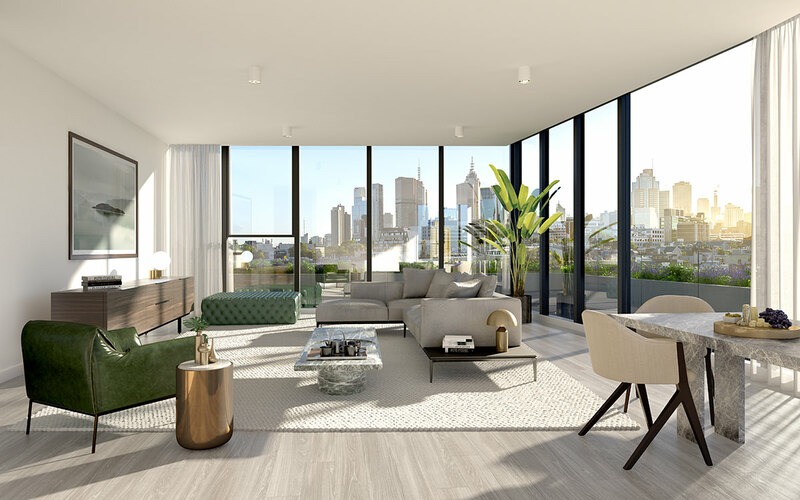 Mimicking the rooftop’s affinity for natural light, the apartment features expansive glazing that invites the outdoors in and has the effect of expanding the space and illuminating the contemporary styling. When the entertaining is through and the guests are gone, retire to your bedroom, a private sanctuary just for you in the grand offering of 88 Cambridge St. And when you wake, you’ll be delighted that you live just a stone’s throw from the vibrant and varied offering of Smith Street with Fitzroy and Collingwood beyond. Strong barista coffee and a touch of retail therapy are the perfect Saturday morning fix. Melbourne buyers are seeking more than just a beautiful apartment. They’re seeking a place to call home – and 88 Cambridge St offers just that. The high demand will be met by the newest release from Centreland Group – a collection of large 3 bedroom apartments with 2 car spaces. 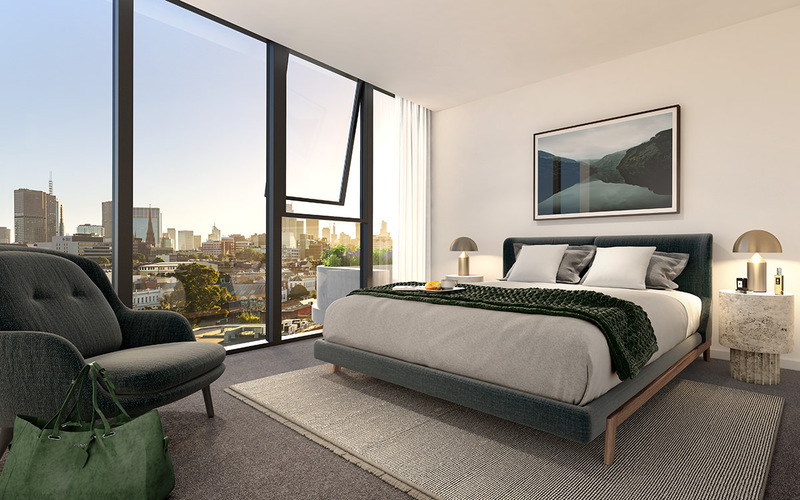 Find out more about 88 Cambridge St or enquire now.